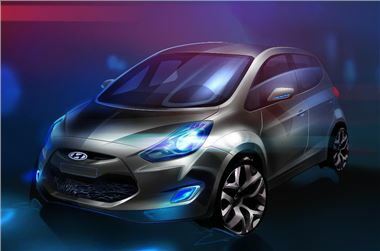 Hyundai will reveal its ix20 mini-MPV at the Paris Motor Show in October and as this initial sketch shows, the mini-MPV promises the sort of sleek looks you wouldn't normally associate with a people carrier. It's essentially the sister car to the Kia Venga but with some key styling differences. Hyundai says it will adopt a 'dynamic, sporty profile in line with the brands's reputation as a modern, progressive manufacturer'. The ix20 has been designed and developed at Hyundai's European research and development centre in Rüsselsheim, Germany and is the second European car, following the ix35, to adopt Hyundai's new ‘fluidic sculpture' design language. The name ix20 reflects the new model's crossover status and Hyundai says it should serve as a functional people-carrier while providing a dynamic, fun-to-drive experience. As well as a flexible and user-friendly interior, it should be cheap to run with a range of frugal engines including 1.4-litre and 1.6-litre petrol engines and a 1.4-litre diesel. It will also come with Hyundai's five year/unlimited mileage warranty as standard. Another model making its world premiere at Paris is the new i10. This upgraded version of Hyundai's popular city car benefits from a comprehensive set of improvements in terms of design and specification including a new 1.0-litre engine with CO2 emissions of just 99g/km, meaning zero annual car tax.